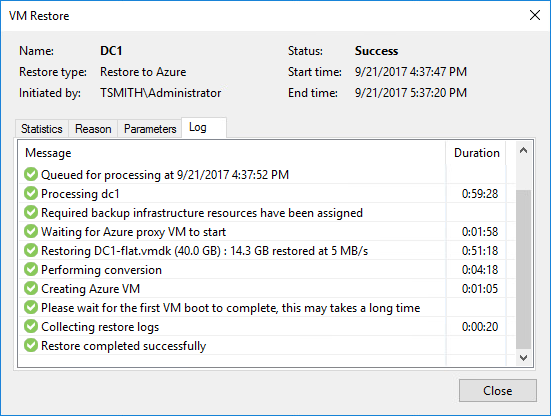 Now that the Veeam Azure proxy is deployed, and we have some workloads protected, it’s time to test a restore. 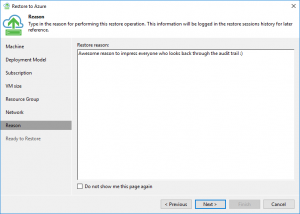 There are a couple ways to initiate a restore within the Veeam console, but all roads lead to the same powerful wizard. 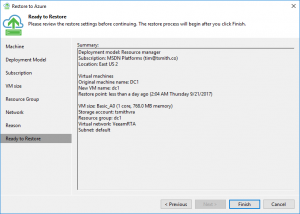 I typically right click on the VM in Inventory, and select the Restore to Microsoft Azure Menu item. 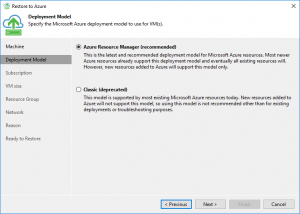 Next, we will select the Azure Deployment Model to use. 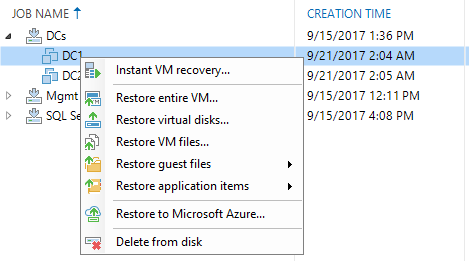 The default is the newer Azure Resource Manager. Continue on to choose the subscription you want to restore into. In my case, I have a single Azure subscription in Veeam which was added in when we deployed the Azure Proxy. Take notice of the region that is listed. This is where you want your VM (in my case DC1) to be restored into. 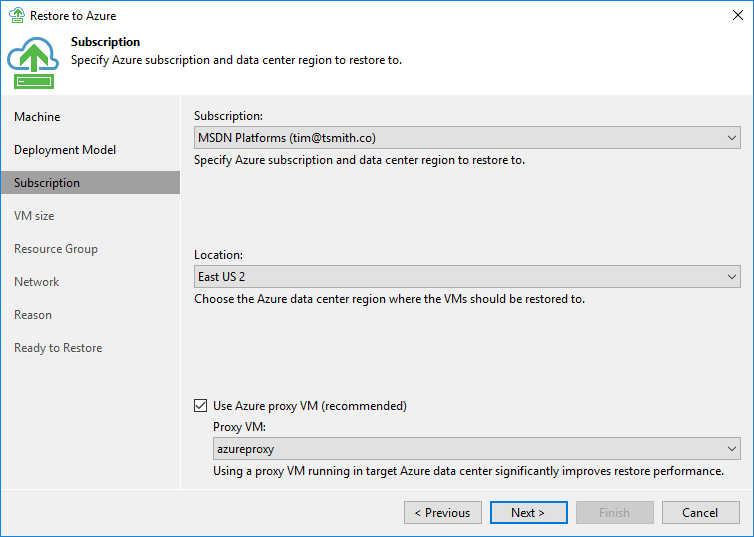 Be sure the “Use Azure Proxy VM” box is checked. 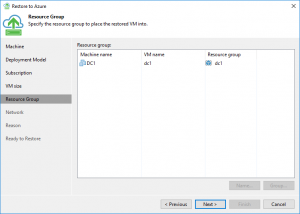 In VM Size, choose edit, and select from the available sizes for VMs in that region. 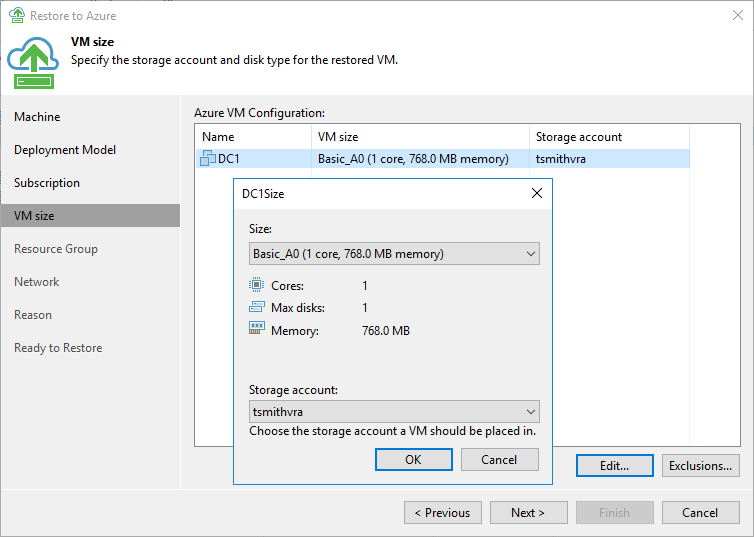 You will need an existing storage account to deploy the VHDs into – which in my case was the same storage account I used for deploying my Azure Proxy. 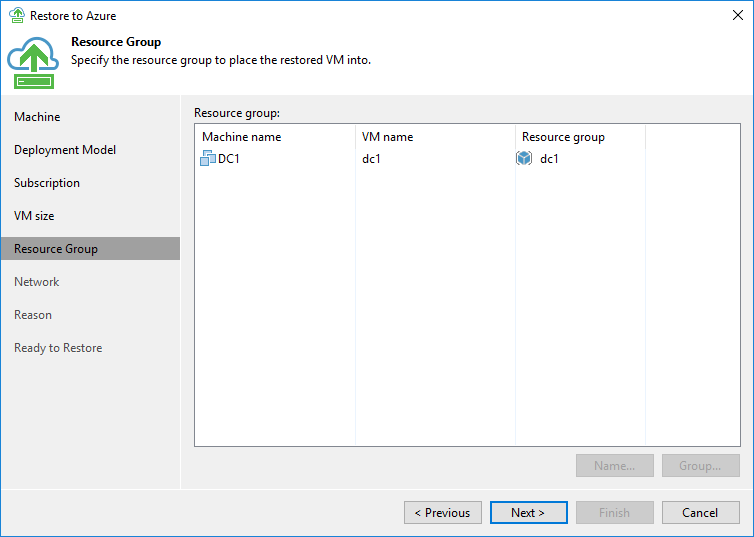 Next, we can select the resource group this VM will be deployed into as well as it’s name. Finally, is the network selection. 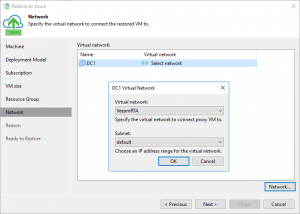 Choose which network within Azure this VM will live, and on what subnet. Last is the option to enter in a restore reason. 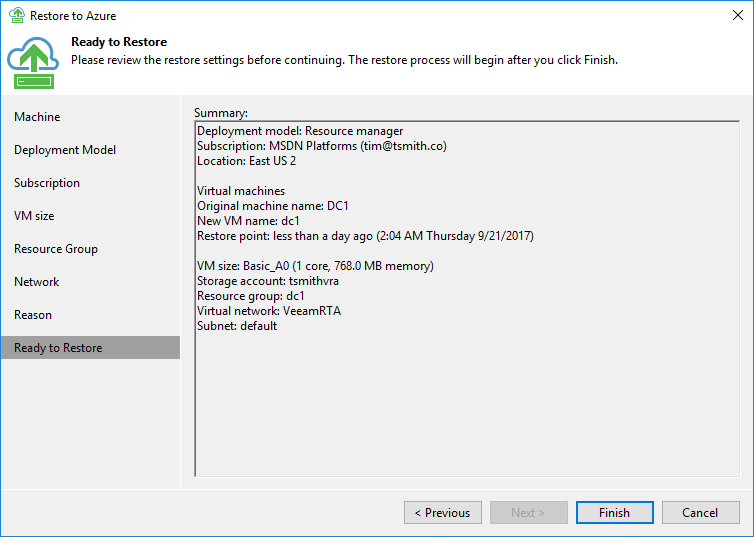 An often overlooked dialog in Veeam, this is a great place to document the reason why the VM is being restored to provide an audit trail. 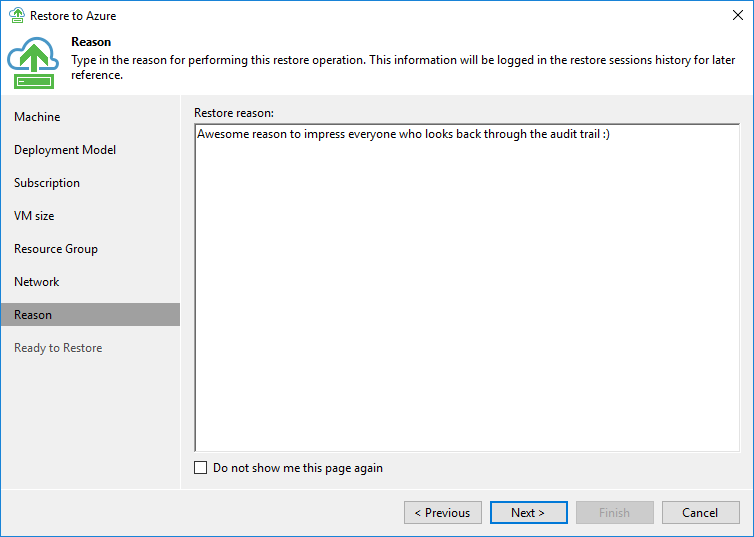 Finally is the summary screen to review your selections before initiating the restore. Under the running job details you can see that we are using our new Azure Proxy, and that we are transferring that VM data between our on-premises location to the Azure cloud. 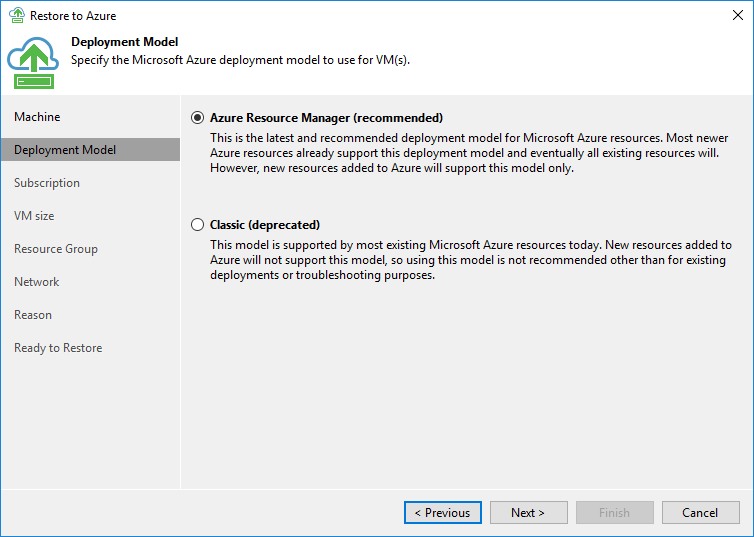 Congratulations, the VM is now successfully deployed into Microsoft Azure! 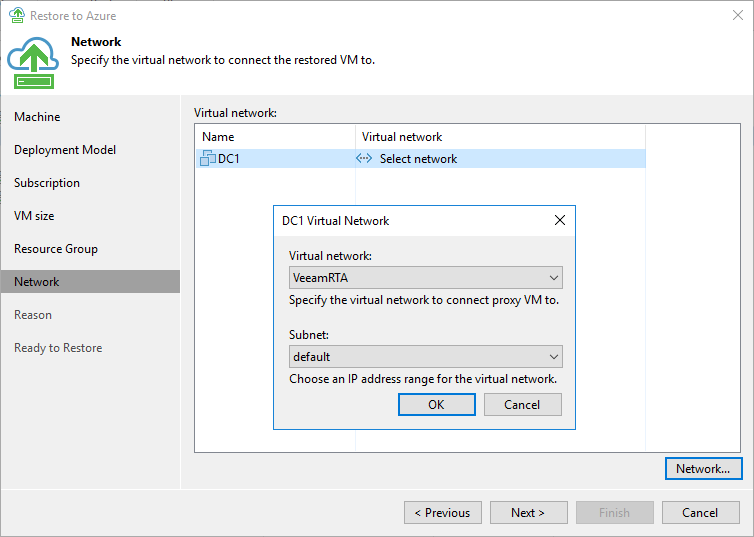 One more important thing (to consider before even restoring into Azure) is network connectivity. If you have Azure Express Route, then you already have a great connection into Microsoft Azure. 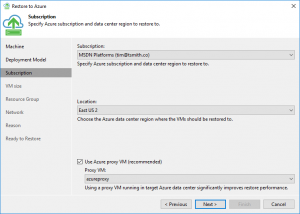 But, if not – you’ll need a way for your on-premises computers to talk to the Azure VM you just restored. 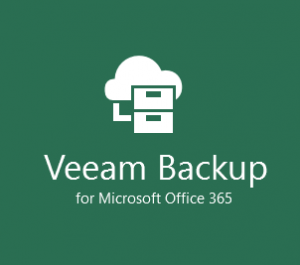 Enter VeeamPN, or Veeam Powered Network! In the next post, I’ll cover how we can use VeeamPN to connect your sites to Azure with an easy to use GUI, as well as advanced options for retaining IP information.